Global Precision Products has heavily invested in the latest contract manufacturing machining technology to provide cost-effective solutions in multi-axis production machining. LESS CYCLE TIME with all machines having 2 or 3 tools machining simultaneously and COMPONENTS COMPLETE with turning and milling combined into one machine translates into cost savings for our customers. 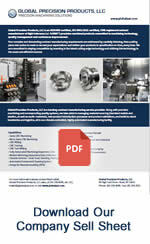 Reduces costs for high volume jobs – offering flexibility, standardization, 24/7 machining and in-process inspection.